It is difficult when you work part time, like to travel and eat great food. You have to be frugal. There has to be a line drawn if you want to be able to eat, as well as pay the bills and squirrel a little money away each week to buy a plane ticket. It's just that... I like to eat. And eat well. I like to buy the best ingredients I can afford and to have a bulging pantry that stimulates my senses and inspires me to cook whatever it is I feel like eating at the time. So what to do when your bank account is looking a little lean and you yearn for something really decadent? I often have this conundrum, but over time I have discovered that many times I don't have too have much in my fridge or pantry to work with - but I don't let this beat me. There are some things I always have in my pantry - dried pasta, dried herbs, canned beans (cannelini, garbanzo, kidney), canned tomatoes. In my refrigerator/freezer - bacon/pancetta, cream, butter, yoghurt, chicken, meat for slow cooking, carrots, celery, onions, potatoes, Parmesan cheese (sometimes I buy the stodgey pre-grated stuff - please don't judge me! Sometimes I just can't afford a $12 wedge of cheese to just sprinkle on the top of my pasta. It is not even gilding the lily). From here you can look into the vast emptiness of your fridge, or with a little imagination, you have the building blocks of many a great dish. Plus there is a sense of satisfaction you get when you make a whole meal with what you have on hand, without needing a trip to the shops. (It is perfectly okay to zip up to the shop for a nice bottle of wine to accompany it). I guess it is okay for me to say 'bla bla bla and you will have a wonderful bouillabaisse with just a couple of prawns, a bulb of fennel and a can of tomato paste in no time...' (even I don't have the ingredients on hand to make that!) but if you plan your shop and 'build' your pantry, so to speak, it does give you more scope in the types of dishes you are able to create. For instance. I don't just shop at the supermarket - not because I want to be all la-de-dah 'Little Miss Continental Shopper' - it is because I don't like what the supermarket calls 'Fresh Produce'. Give me a break. I am somewhat blessed to have a weekly Farmers Market every Sunday where I can buy my produce fresh from the grower. 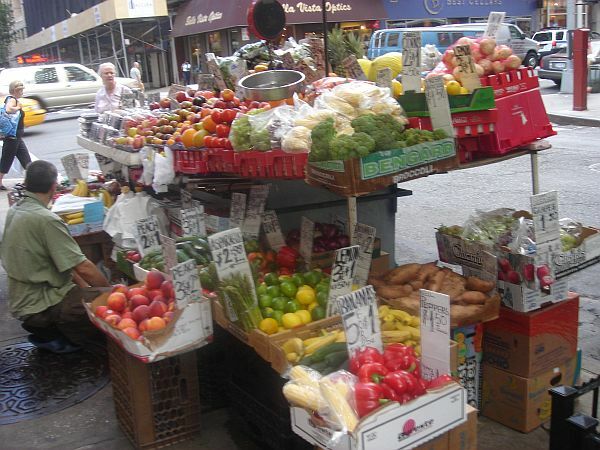 I find that my market produce lasts up to 3-4 weeks longer than the limp, pitiful produce I get from my major retailer. It is just a smarter option for me because the food lasts longer, which means I end up cooking and eating all of it without fear of spoilage. I use the supermarket for non-perishables and toilet paper. I can even get my meat and poultry from the Farmers Market. Everything from roasting beef, and chicken, to spatchcock, duck and fois gras if I so desire! It is a feast for the senses, it inspires me to go home and cook as well as having a delicious breakfast of kransky with sauerkraut or a decadent chocolate croissant. 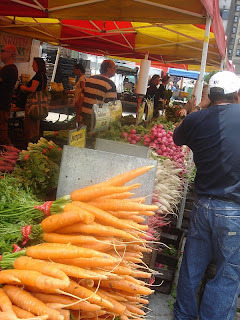 I am going to sound all pretentious now and tell you about one of my great foodie finds - the Farmers Market in Union Square, New York City. I never knew what an heirloom tomato looked like, let alone how many varieties of tomato there were until I paid this market a visit. The first time I went to the Farmers Market there was in September, so it must be the height of tomato season in the States. There were red, purple, yellow, blue, green, even brown tomatoes of all shapes and sizes. The smell was insatiable. There is nothing like the aroma of a perfectly ripe tomato to get your senses reeling. On another jaunt to New York, the following June, I purchased some fruit from a street vendor - let me tell you it is worth stopping for the summer peaches. I had the sweetest, most delicious peach after a 'beautiful sandwich' from Blimpie, eaten on my pashmina/makeshift picnic rug in Central Park. I have a zillion New York food memories that give me inspiration. So with a little forward thinking and preparation, you can develop a pantry and a repertoire of recipes that are quite versatile. All you have to do now is resist the urge to phone for take out or have toast for dinner! I would love to spend a week with you, just to taste all the things you cook in a typical week! I'd even try and help with the preparation!